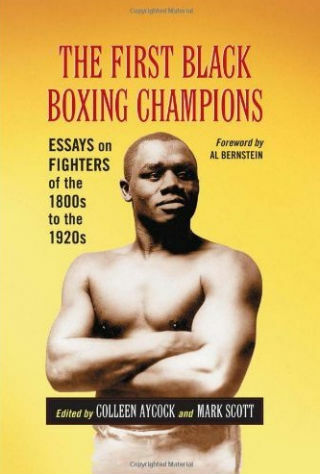 By John J. Raspanti, Doghouse Boxing: Released last May, The First Black Champions is a meticulously researched and compelling look at fifteen of the most famous and talented boxers of the turn of the century and after. With a foreword by Al Bernstein, editors Coleen Aycock and Mark Scott do a wonderful job of compiling each biographical chapter. The compilation of fifteen biographical essays depicts the struggles of the African American fighter inside the ring and out. The volume combines a piece of boxing and American history with a copious collection of never before seen photos, cartoons, descriptions and fight posters. Jack Johnson is the most famous name in the book. To white America at the time Johnson, who won the heavyweight championship in 1908, created a stir in white people with his talent in the ring and lack of respect out of it. Mark Scott uses Johnson's own words to help the reader understand the former champion. Each essay is wonderfully informative and unique chronicling the rise and sometimes-tragic fall of the boxers. The book gives insight into the advent of the “colored title” weaving it through the early decades. Billy Calogero opens things with an excellent account of former slave Tom Molineaux’s drive to be the first black American to win the heavyweight title. Sadly, a theme is set in place, as Molineaux not only has to battle his opponent Tom Cribb, but a malicious audience. Bob Peterson’s expertly tells the story of the great Peter Jackson who then champion John L. Sullivan refused to fight. Peterson sheds some light on Jackson’s short but extraordinary life. Coleen Adcock’s fascinating account of legendary Joe Gans is a joy to read. Adcock’s writing brings the old champion back to life from his roots in Baltimore to his exploits in the ring. Finding information on the “Barbados Demon” Joe Walcott has always been a challenge. Standing only five two and weighing one hundred and forty five pounds, Walcott knocked out fighters who outweighed him by sixty pounds. Mike Schmidt’s essay reveals the extent of Walcott’s talent and provides details of his final years working at Madison Square Garden. The name Jack Blackburn will always be associated with Joe Louis. Joseph Bourelly writes about the trials and tribulations of Blackburn’s life before he met and began to train Louis. Long considered one of the best fighters of his generation, Blackburn had his boxing career derailed by a murder conviction. Clay Moyle does an admirable job of telling the story of Sam Langford, as does Alex Pierpali with his duel biography of archrivals Sam McVey and Joe Jennette. The book concludes with the tragic story of light heavyweight champion Battling Ski. Peter Benson’s prose flows beautifully as he probes the myths of Siki’s short life. Maligned often by the press and mocked by fans and critics alike, Siki’s life is a sad affair of lies, deception and ultimately murder. Benson’s essay is part social commentary, biography, and mystery as he works to explain Siki’s mercurial personality and solve his murder. Other fighters examined, are George Godfrey (Tony Triem), George Dixon (Mike Glenn), Bobby Dobbs (Kevin Smith), Dave Holly (Douglas Cavanaugh), “Dixie Kid” Aaron Brown (Cathy Van Ingen) and Speedball Harden by Chris Cozzone. The First Black Boxing Champions is not only a book for boxing fans, but for those curious of how things were one hundred years ago. The respect these champions deserve is long in coming as is the recognition. This collection of essays pays these men there due and provides the reader a look at how America once treated its superior fighters. For more information on this book please visit the website.